MILWAUKEE — Giannis Antetokounmpo ran and dunked all over the Pistons until they just shoved him to the ground. The team with the NBA’s best record wanted to show it can make a long playoff run, and the Detroit Pistons were helpless to slow them down. 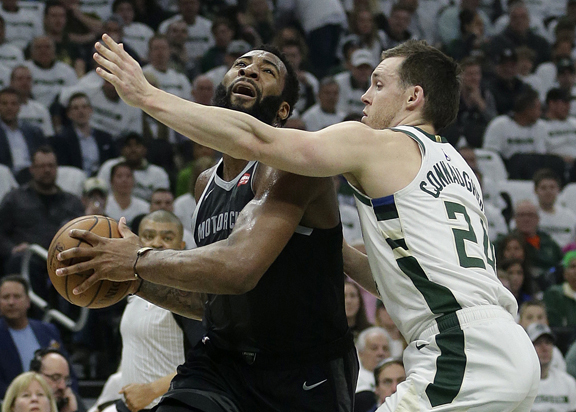 Antetokounmpo had 24 points and 17 rebounds in just 24 minutes, and the Milwaukee Bucks rolled to a 121-86 victory on Sunday night in the opener of their first-round playoff series. Seven players scored in double figures for the Bucks, who led by as many as 43 points. Their 35-point margin was the third-largest in the franchise’s playoff history. The Pistons only really caught up to Antetokounmpo when center Andre Drummond shoved him to the ground with both hands late in the third quarter, after the MVP candidate grabbed an offensive rebound with Detroit trailing by 41 points. Drummond was given a flagrant 2 foul and ejected. He blew a kiss to the Fiserv Forum crowd as he was escorted off the court. Luke Kennard paced the Pistons with 21 points off the bench and Drummond had 12 points and 12 rebounds. Detroit played without forward Blake Griffin, who sat out with a left knee injury.